Instructions on how to light the pilot light on gas water heaters from Kenmore, Rheem, Bradford White, AO Smith and other manufacturers. 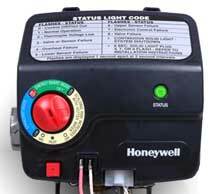 Lighting the pilot light when using the Honeywell, Rodgers-White and Robertshaw gas control valves. Every gas water heater has the lighting instructions found on the label attached to the heater. If such instructions are missing and you have to replace the pilot assembly or fix any other problem that requires re-lighting, follow the instruction found here. 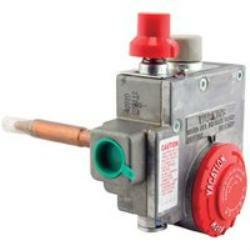 I will cover different types of the gas control valves that are using the piezo-electric spark ignition system. The pilot flame is ignited by the electric spark that is generated when the igniter button is depressed and can be seen through the sight glass window. Once the pilot light is lit it remains ON. The gas is also available to the main gas burner, and as long as there is a call from the thermostat, the pilot flame will ignite the main burner. If you require more info about problems and troubleshooting the pilot light, use this article. Notes: If you want to learn how to light the pilot light properly, always follow the manufacturer's directions. One of these instructions says to fill the water heater with water fully, purge the air from the gas line and never light by hand. Use your hand to push or turn the gas control knob, never tools. If the knob is blocked and does not want to operate, stop and call the technician - do not attempt to repair. Turn the gas control/thermostat knob to OFF position. The outer door should be temporarily removed to clear out any gases. Turn the gas control knob to the "Pilot" position. By pushing the knob in, gas will flow to the pilot burner only. Then press the piezo ignitor button. Sometimes it is needed to press it several times. If the flame is lit, keep the knob depressed for half a minute until the flame heats the thermocouple and generates sufficient electricity to keep the gas valve open. Release the knob and the pilot flame should be lit. Keep in mind that the knob cannot be turned from ON to Pilot unless it is depressed. 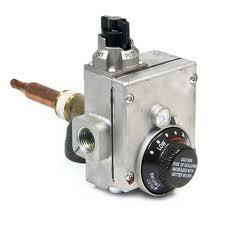 To turn the gas water heater ON, put the knob into the ON position and set the thermostat dial to the desired setting. Recommended hot water temperature is usually marked by the arrow. If the pilot didn't light, repeat the previous steps, but be careful to purge the gas from the combustion chamber by opening the outer door. Set the thermostat to its lowest settings. Put the control knob to OFF position. In some cases, it is needed slightly to press the knob down to turn the knob from Pilot to OFF position. Wait for a few minutes to clear any gases. Remove the outer door. Turn the gas control knob to the pilot position. Depress and hold down pilot set button or gas control knob. At the same time, press the piezo igniter until you hear the "click" sound. Once the pilot light is ON continue holding the pilot set button or gas control knob for a minute, so the flame can heat the thermocouple. Release the button or knob which should pop back up. Turn the gas control knob to ON position. Set the thermostat to the desired temperature. As seen from the above instruction, lighting the pilot light is not hard... but be careful it might be dangerous. That is why you should always consult the instructions on how to light the pilot light properly and safely.